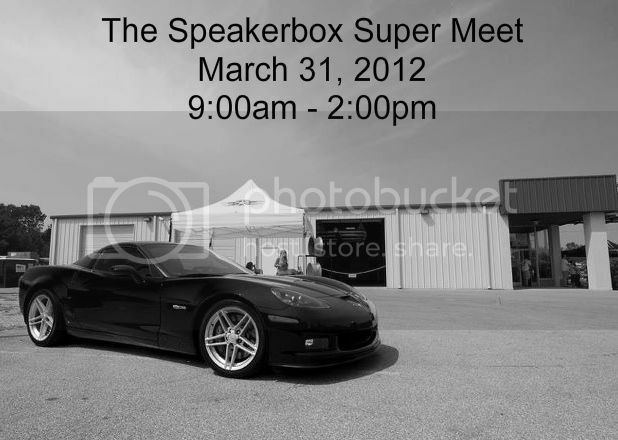 Last September we had our first ever car meet and greet held here at The Speakerbox. 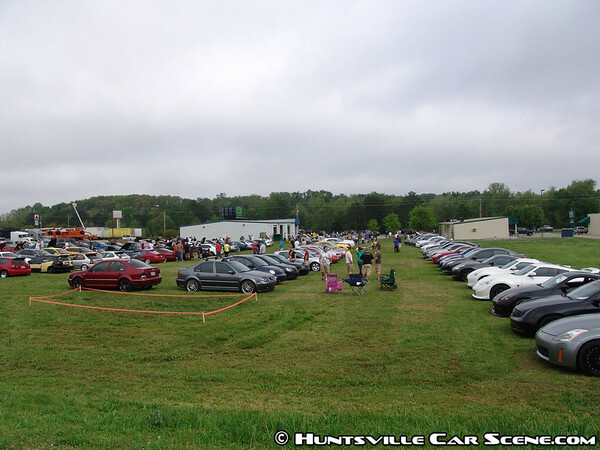 That Saturday, we had over 100 cars in attendance! We expect some bigger numbers this year! The meet starts at 9:00am and ends at 2:00pm. There will be prizes, giveaways, and other vendors here as well! This will not be one to miss! There will be a DB contest for $10 per car. There will be trophies for overall loudest as well as the top 3 in less than 3000 watts and over 3000 watts. Contact Beck at The Speakerbox if you have any questions or would like to be a vendor. 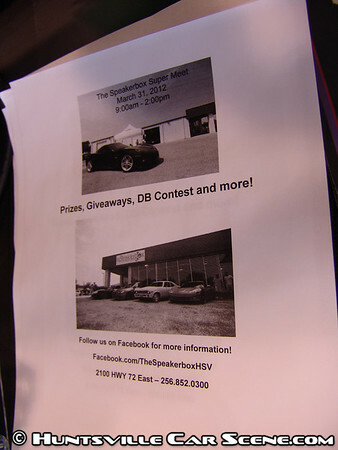 This was the second ever Speakerbox Super Meet. And there were a lot of lessons learned from the first that made the second event something that no one could have imagined, including myself. The event didn't double in size, but more than quadurpuled in size. 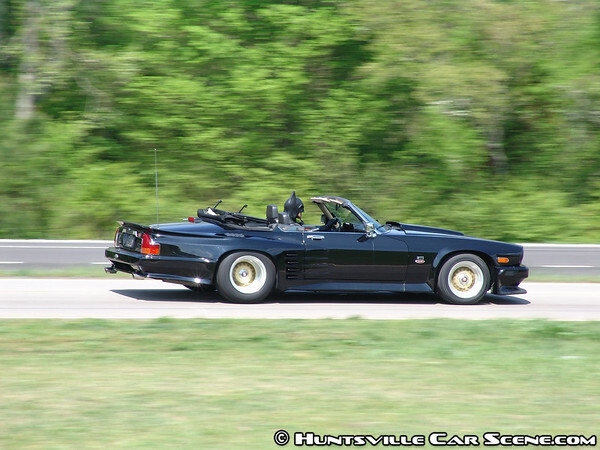 Around 400 cars were at the meet, with about 200 present at any point in the day. 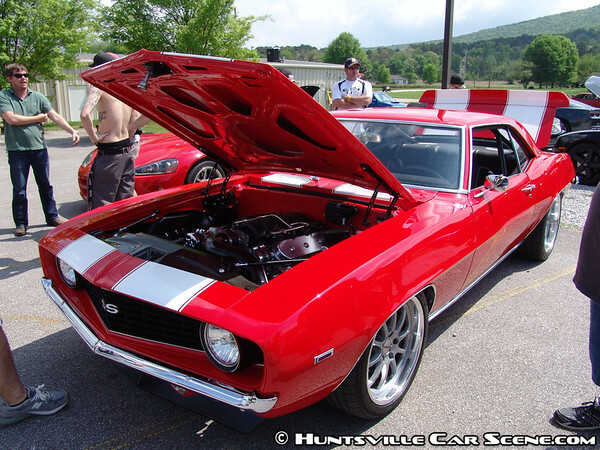 Several groups were rolling in together--North Alabama Mitsubishi Owners, North Alabama Nissan Owners, Huntsville Flat Four, Rocket City Mustang, Rocket City Camaros, Limestone County Mustang Club, H2O Tuning, North Alabama Cobra Club, and more. There was a wide variety of vehicles, groups, and enthusast cultures. And it definitely kept you from being bored. My day started early as I wanted to capture the various groups at their nearby staging spots before they rolled in. 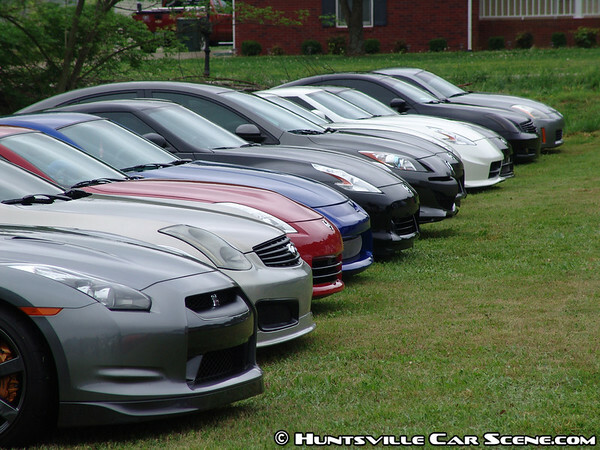 Within 3 minutes of Speakerbox, over 50 cars were staging at various places to roll into the meet. 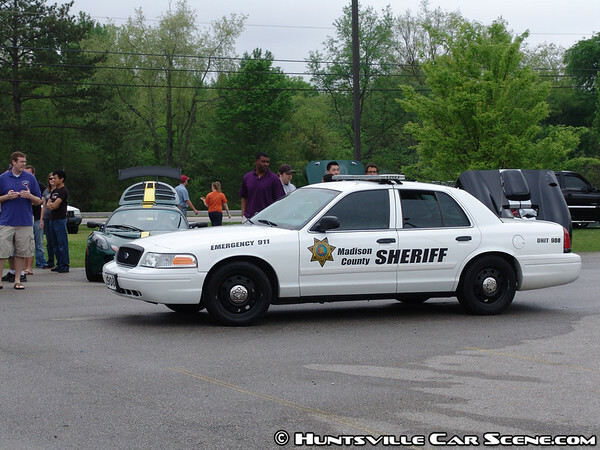 And there were still several groups staging in Huntsville. By the time it was 10:30am, we were aware that we may have a problem we never anticipated in a grass field that can hold 200--we were running out of parking. Even though a Samir Patel died a week ago, people were still telling me that they were glad I wasn't dead. It still amazes me how many people cared to reach out when they thought that was me. As group after group rolled in, the parking got more and more organized. But then it became apparent that there's just not many spots left. 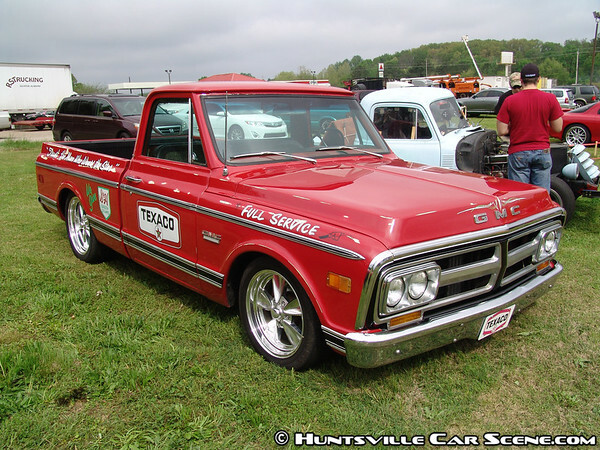 The overflow was the truck parking next door, which soon became the spectator lot. Luckily, some groups started rolling out by 11am as other groups started rolling in. So for a few hours, there was a constant churning of parking. All evidence of the organized group parking soon dissappeared as all makes and models mixed in together. 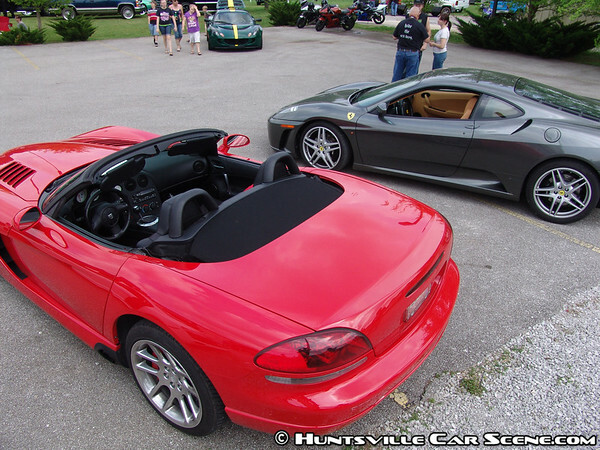 And it was around 11am that the first crop of exotics started showing up starting with a red Ferrari F430. This was followed by a white R8 V10, and then a red Viper, and another Ferrari F430. The dark grey GTR that arrived earlier in the day with the Nissan group opted to stay hidden in the crowd pretending to be just another car, hehe. Worked out pretty well as a lot of people didn't even notice it there. 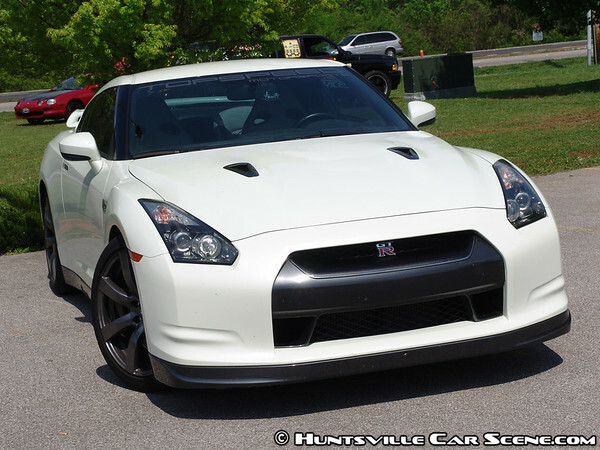 Can you spot the GTR? As the first crop of exotics left, more exotics replaced them including a T-Rex, Lotus Exige, Pro-street Camaro, and a white GTR. 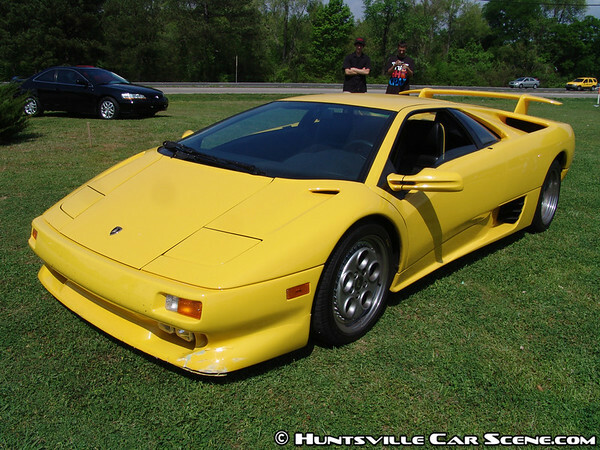 After the event a yellow Lambhorghini Diablo VT swung by, one of only a handful built in 1995. 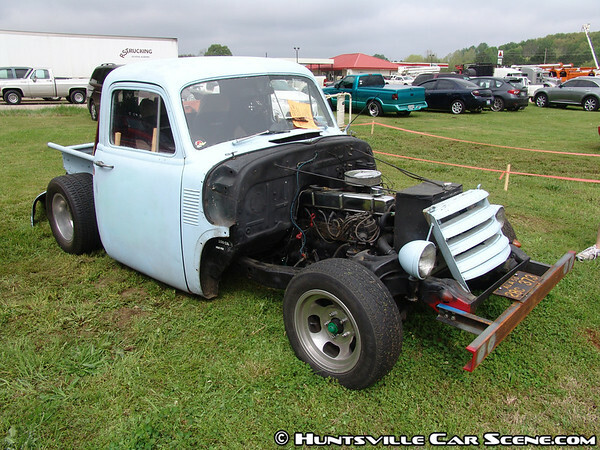 But exotic cars and local groups weren't the only ones attending, lifted trucks and mini-truckers also attended, either jacked to the sky or scraping the ground--and everything in between. Even the police stopped by, but not intentionally as it was a routine traffic stop where the driver turned into the event. 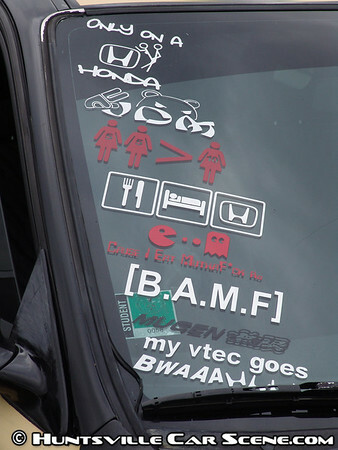 The coolest thing I saw at the meet was some older enthusiasts (aged 50+) reading all the stickers on the Hondas and picking their favorites. They found them as entertaining as the rest of us. Even though it was supposed to rain, the weather was actually perfect with clouds overhead early for the perfect photos until it burned off by mid-day. The lovely Jeannie joined me for some photos like she did at the last meet. She's one of the most talented and professional people I've had the pleasure to work with. She is ideal for promotional work, and is readily available. 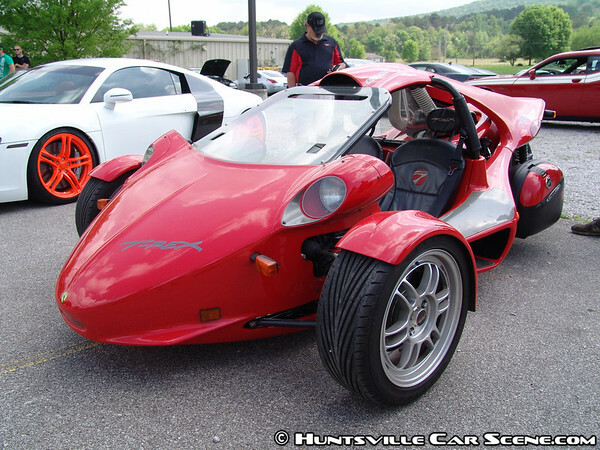 But Jeanie wasn't the only person getting attention once Huntsville's own Batman (Britbat007) arrived. He is just like the Batman that became famous for getting pulled over in his Lamborghini Batmobile that volunteers his time at local hospitals to help boost the morale of children fighting diseases like cancer. I spoke to our local hero and he mentioned that he's not getting called as much anymore, and he's not sure why. The hospitals used to do a 'superhero day' when Batman, Wonder Woman, and other heroes dressed up and visited sick kids. I think the idea is still terrific and needs some awareness. He's definitely the type of hero this town needs. One of the typical things to do when leaving an event, any event, is to 'get on it'. But it's really important where to draw the line with this type of exhibition. 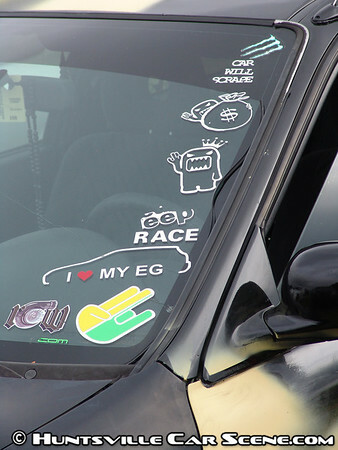 I've seen enthusiasts, young and old, sometimes push it a little too far. When someone goes over their limit and gets hurt or property is damaged, an event like this isn't fun anymore. Keep it safe everyone. After I work all day at an event like this, I'll usually have a bunch of missed calls, voicemails, and texts to return. It was ironic though that all three missed calls were from people named Anthony. What are the odds of that? Can't wait! I've been looking through some of the HCS pics from last year, and should be getting to them soon. I look forward to doing this again. I'll be promoting and hopefully dragging along the rest of the bums with me. Hopefully I can make it this year. I hated missing it last year. Wait until you see my pics...then you're really going to miss that you weren't there. I'm working on the same thing bro. NAMO and NANO will be there in force! I say NAMO hits the Citgo next door since my relatives own it and it has a huge truck parking in back. I'm hoping to make it out, I'll try and bring a few people as well. Maybe I'll have a car by then. It's a long shot but we have our land cruiser done by then I'll try and talk dad into driving it over, with a top speed of only around 50-55 they normal don't get to far away from the house.........lol. Last edited by EvilZ; January 19th at 09:26 AM. It would be awesome to see that Land Cruiser. But I'm sure whatever you bring will be good. 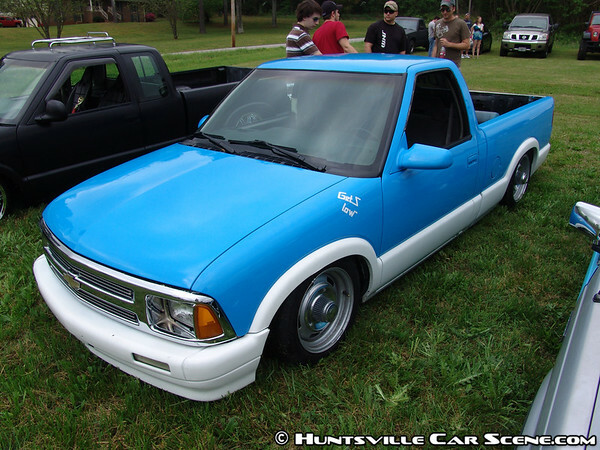 This has been posted on the Subie Flat Four forum and I know a bunch of guys are coming out. I am going to try and get together with Dana and see if we can't coordinate with the Speakerbox about another dual-type meet within this meet. I'll be there! Hopefully springtime will be in full swing when this rolls around. I talked with Dana Saturday before your meet about it as well. Definitely sounds like a good idea and I'll just need an estimate for the amount of cars you guys will be bringing out so I can set aside spots. I've let me H2O Tuning buddies know of the event.. looking forward to it! Hopefully I can make it out to this one, really enjoyed the last one. I should be there again this year! Good turn out last year! Bump for this thread to start planning and get more attendance.